Can you live with only half your brain? Can you still function in life? Lin Shinn-zong (林欣榮), a renowned neurosurgeon in Taiwan and the superintendent of Hualien Tzu Chi Hospital, recounts a story that testifies to the resilience of the human body and spirit. 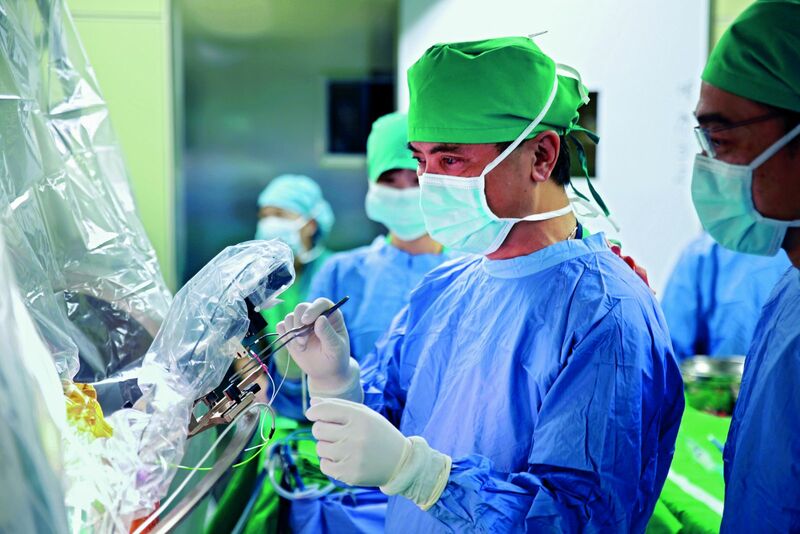 Dr. Lin Shinn-zong implants a microchip into the brain of a patient. I came to know Xie Rui-teng (謝睿騰) when I was chief resident physician at Tri-Service General Hospital, Taipei. That was more than 30 years ago, when he was just 23 years of age. He had been in an accident that had injured his spine and deprived him of his ability to walk. I operated on him and helped him regain his mobility. He was an outgoing and warm person, so we stayed in touch after his surgery. Years later, I left Tri-Service and joined Hualien Tzu Chi Hospital in eastern Taiwan. Rui-teng was strong, healthy, and 11 years younger than I, so I was surprised when he came to seek my help again one day in 2004. By that time, he had started a family and had had two kids. I had seen countless patients with his symptoms, so I was pretty sure what his problem might be. “You’re likely suffering from Parkinson’s disease,” I said, “but yours seems to be a mild case. Medication will probably be enough to ease your condition.” I then arranged some tests for him to confirm my suspicion. (宏昌). An-qi was in ninth grade and Hong-chang in sixth. Li-feng said to Rui-teng, “You stay here and finish the tests. I’ll go home first and see how things stand now.” Li-feng checked the time and saw that she could still make the last flight from Hualien to Taichung, central Taiwan, where they lived. She grabbed her purse and rushed out to hail a cab for the airport. The news threw Rui-teng into a frenzy. He couldn’t find a single moment’s peace. When I was making my rounds that night, I found him looking very upset and stressed. I thought he was worried about the test results, so I tried to comfort him. It was then he told me what had happened to his children. By the time Rui-teng arrived at the hospital where his two children were being treated, Hong-chang had already left the operating room, but he was not out of the woods yet. An-qi, originally thought to be in better shape, was being taken into the operating room for emergency surgery. All the hair on her head had been shaved off. The doctors told Rui-teng that her head was full of blood. Rui-teng was so shaken he passed out on the spot. Like one freshly awakened from a dream, Rui-teng dialed my number on his cell phone. He was certain this time that the tremor in his hands was not caused by Parkinson’s disease, but by an overwhelming fear. I was in a meeting at the time, but when I saw Rui-teng’s name on the screen of my vibrating phone, I picked it up. “How are the kids doing?” I asked. “Hello, I’m Lin Shinn-zong,” I said. After briefly introducing myself, I asked the doctor about the condition of the two children. While I listened to his reply, I pondered how to best help the kids through this crisis. I was very lucky because the physician trusted me enough to note down every treatment method I suggested. He even borrowed medicine from another hospital to use. He tried the best he could to comply with my suggested regimen. A week later, the kids were still in a coma. I urged Rui-teng not to lose heart. I taught him and his wife how to read the numbers on the machines, and I told them to be sure to alert the care team if the kids’ heart rates or blood pressure dropped below a certain number. Over ten days later, Hong-chang finally woke up. An-qi woke up too, but not until over 40 days after the traffic accident. They were both in a poor state, but they displayed completely different symptoms. Hong-chang became violent, hitting, kicking, or even biting others. He wouldn’t stop his attacks even when his hands and feet were bound. An-qi, on the other hand, became like a soulless doll. She laid motionless in her bed with her eyes open, never smiling, moving, or saying a word. “Yes, she loves two very popular boy bands,” said Li-feng. “Then play their songs to her every day,” I suggested. To do that, Li-feng purchased a cell phone that could play music and played An-qi’s favorite songs to her day after day. 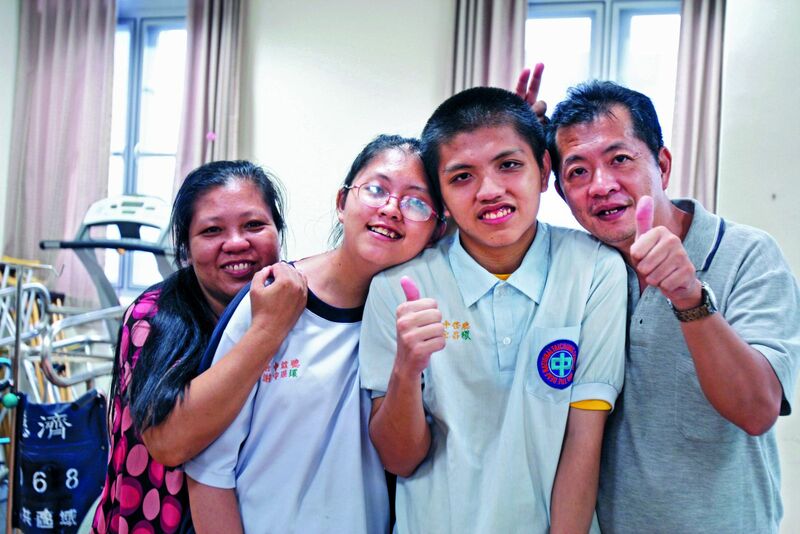 Slowly, An-qi broke free from the shackles that imprisoned her and was able to interact with her parents, even though her spirits and mobility were still worse than those of an infant. The boy settled down upon hearing my words. A smile narrowed his eyes into two slits; he seemed to have found what I had said very amusing. “I’ll be good and take my meds every day,” he said. An-qi didn’t admit defeat despite the loss of her left brain. She worked hard to regain her ability to talk, write, and walk. After that, Rui-teng brought An-qi and Hong-chang to see me every month. He continued to do so after I had left Hualien Tzu Chi Hospital and served at China Medical University Hospital in Taichung for some years. Along the way, I witnessed the two kids’ condition improve. Hong-chang did better. An-qi, minus her left brain, had a tougher time recovering, but she still made progress. She even regained her ability to speak. I seemed to hear a broken heart behind those words, as if she felt that her fate had been sealed by that tragic accident. My words seemed to give her hope. From that day on she began to study very hard. When she encountered problems in her studies, she would come to me for help. Even though I had told her she was welcome to drop by my office at any time, she never did because she didn’t want to disturb me in my private time. Instead, she would make appointments like a regular patient and wait outside my consulting room until it was her turn to see me. Then she would come in, open her book, and ask me to help her solve her problems. Later, in 2010, she gained admittance into the Department of Healthcare Administration at the Chung Hwa University of Medical Technology, and she also won the Presidential Education Award for her courage and perseverance in overcoming hardships. Those were not just words of comfort, but the truth. An-qi once said that the traffic accident was the greatest pain of her life. However, that accident also allowed me to take part in a medical miracle. An-qi lost her left brain—which performs tasks that have to do with language, logic, numbers, etc., and is responsible for controlling the right side of the body—but her right brain took over and performed those left-brain functions. Along the way, An-qi displayed outstanding resilience in working hard to regain those abilities. I’ve witnessed countless deaths in my long medical career, but I’ve also seen countless lives bounce back after being almost crushed. An-qi and Hong-chang were two great examples. Their calling me “Daddy Lin” was my greatest reward. The Xie family has been through a lot. They have been there for each other all along the way. From left to right, Chen Li-feng, An-qi, Hong-chang, and Xie Rui-teng.